Canvas Prints by the #1 Photo Canvas shop in the UK. Canvas Prints: Lowest-Price Guarantee, Ready to ship in 24h. How to create Photo Canvas Print? Just like with a classic art canvas, your photo on canvas is stretched to fit the frame perfectly. Just make sure during the image selection process that none of the essential elements of your photo are located too close to the edges. Your image can be seen in its full glory on the front side of the canvas print. The outer edge of your photo is then copied, inverted, and added to the frame after the main print has been completed. For this type of canvas print, the outermost pixels of your photo are stretched lengthwise and reproduced all around the outer edge of the frame. Your image is visible in its entirety on the front side of the canvas. 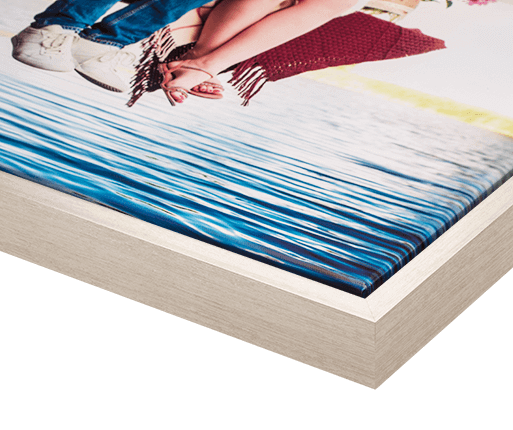 With this type of edge design, your photo is scaled to fit perfectly on the front side of your chosen canvas. The outer edges of the frame are later covered with strips of white, helping to strengthen and highlight your image. Your image is scaled and printed only on the front of the canvas, while a black edge is applied to the sides of the photo canvas frame later on. The black outer strip wonderfully complements most surroundings and adds a pop of contrast! During the manufacturing process, we use only the highest-quality stretcher frames made of carefully selected spruce wood. The solid wood frame is 2cm thick. The overall weight is surprisingly light, meaning you’ll only need a couple of nails to put up your new picture canvas. Choose the XXL wooden frame for improved stability and a genuine gallery-worthy look! This works particularly well with large format photos on canvas, giving them extra stability and expressiveness. The thick yet featherlight spruce wood frame makes it easy to hang. Due to its extraordinary depth, you can display your canvas with the XXXL wooden frame either hanging or standing. Whatever you decide to do, the XXXL wooden frame is impressive and gives your photo that final touch. The framework of choice for your photo canvas. The characteristic folded edges of the canvas are visible within the decorative floating frame, making this a very popular framing style in galleries. Personalised canvas prints aren’t only for your walls! Some of our smaller formats can be shown off on flat surfaces too, if you select the easel back option. 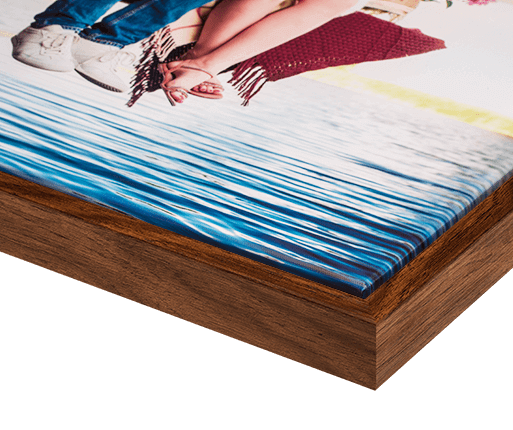 These stands let you prop up your photo canvas print in portrait or landscape orientation. Featuring a handsome black-velvet backing, your easel back canvas print also comes with eyelets on the back for wall hanging. When you’ve made all your customisation choices, it’s time to proceed to the shopping cart – and once there you can add another great little element to your order. For a small additional price our easy-to-use hanger set will be included with your photo canvas. Follow the simple and efficient process and you’ll have your new canvas print up on the wall in a jiffy! Why our Canvas Prints are the Best Choice? Our canvas prints have the seal of excellent manufacturing, as confirmed by our high customer ratings and thousands of loyal clients. Made with solvent-free HP latex inks and genuine spruce wood frames, they’re some of the most wallet-friendly and best canvas prints on the market. Can Canvas Prints be Framed? Our photo canvas prints come with a spruce wood stretcher frame providing robust support to your image. 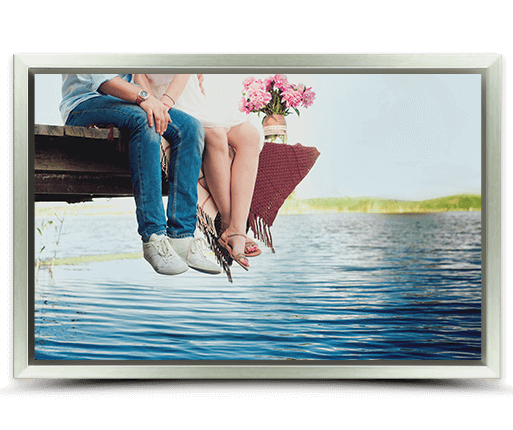 You can upgrade to framed canvas prints with a beautiful “floating” outer frame, giving the composition a refreshing modern look. Select your framing option during customisation. What are the Largest Canvas Prints I Can Order? Our canvas prints are available in a wide range of sizes, from small tabletop pieces to 120 x 80cm prints. Before you upload your photo, just make sure it has the right resolution, as photos featuring the lowest pixel counts can appear blurry if they’re printed on large canvas prints. Can I Add Text or a Quote to my Canvas Prints? Your photo canvas prints give you the option of adding personalised text. Upload your photo, select your format and add your text. Create your canvas prints with text in the perfect size, font and colour for the style of your photo. The “add text” button is under the preview window. How to Hang a Canvas Print on the Wall? For a more detailed tutorial, check out our video here. How to Maintain and Clean Canvas Prints? Our canvas prints are easy to maintain with gentle cleaning using a dry or slightly moist cloth. If it’s performed properly the procedure shouldn’t affect the quality of your print at all. Gently rub the surface of the canvas with the cloth to clean away any possible build-up of dust. Our photo canvas prints encompass a little bit of everything – great structural build, top-notch digital photo printing, and a great combination of traditional woodwork expertise and high-tech industrial performance. Printed with special UV-resistant inks that won’t let the original colours dissolve over time, your photo canvas will radiate with the finest colours, contrasts and image sharpness! Every canvas manufactured at our facilities is specially prepared to be used for industrial printing. This is done to ensure flawless image quality, as each canvas is specially matched with our HP latex inks for the best possible results. The best thing about the whole process? There are no solvents in sight. That means our canvas prints are perfectly safe for children and for allergy sufferers! Every single canvas photo is all set for shipping within 24 hours from the moment of purchase. Thanks to our perfectly organized manufacturing practice, your new home decor will be ready in the blink of an eye. What’s more, the finished product will arrive in a special insured package designed to keep your precious canvas perfectly safe during the trip. Each canvas print is manually stretched over a top-quality spruce wood stretcher frame and securely attached at the back. Your canvas photo prints are completely ready to brighten up your walls once they’ve arrived. Our ingenious stretcher frames are the result of our years of hand-crafting experience allied with the most sophisticated technologies – all for your pleasure and convenience! 2019-04-09. With a customer rating of 4.7 stars from a possible 5, My-Picture.co.uk has an excellent 93% rating based on 100% of the 18001 reviews collected by Google and/or its partners. Start designing your Canvas Prints now!